Trend analysis of droughts and their geospatial and temporal variability assists decision-making about water resources management around the world and decreases the harmful effects of drought that affect the entire population. This work aimed to analyze short-, medium- and long-term droughts and their trends in the Brazilian state of Paraíba from 1998 to 2015 using Tropical Rainfall Measuring Mission (TRMM) data and applying the Mann–Kendall test and Sen’s slope estimator method, based on the standardized precipitation index (SPI). TRMM data were validated by comparison with data from 267 rain gauges in the region, which showed the consistency of the satellite data. Therefore, 187 monthly TRMM rainfall time series were used, each with 216 months. The series were equally distributed over the entire study area. 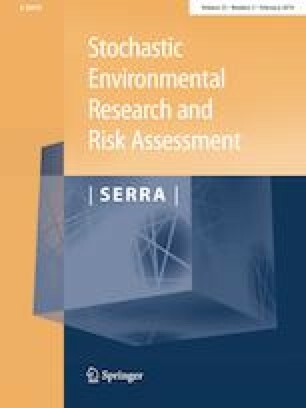 At the significance level of 0.01, a new geospatial classification of drought severity is proposed, through which it is possible to determine exactly which types of drought events affected or did not affect a given region based on the SPI and the trend of the analyzed SPI time series, which shows the situation of drought risk analysis. The results of the comparison between long- and short-term droughts indicate that the wettest regions of the state of Paraíba are strongly affected by extreme drought events and show trends with increasingly negative slopes. In this way, the proposed geospatial classification is proved to be a useful tool because it provides information about the current drought situation of a given region, simultaneously showing the trend slope with respect to short-, medium- and long-term droughts. Drought is one of the most complex, important and recurring phenomena on the Earth, which affects agriculture in various territories and especially in arid and semi-arid regions (Mansouri Daneshvar et al. 2013; Mathbout et al. 2018). This phenomenon has impacts on different aspects of society, such as socioeconomic, biological, social, agricultural and political. Furthermore, drought is one of the most poorly understood natural phenomena and is perceived as one of the most expensive (Wang et al. 2014). Therefore, analysis of drought and its severity for a river basin that supports agriculture and other human needs is necessary for better planning and management of its water resources (Thomas et al. 2015). The monitoring of different types of drought is based on indices that standardize on temporal and regional scales, such as: (a) the Palmer Drought Severity Index—PDSI (Palmer 1965), (b) the Standardized Precipitation Index—SPI (McKee et al. 1993; Wilhite et al. 2000) and (c) the Standardized Precipitation Evapotranspiration Index—SPEI (Vicente-Serrano et al. 2010), which allow comparisons of water conditions in different areas. Such indices have been used in state and federal policies as parameters to assist decision-making regarding the adoption of plans to combat the implications of drought in various sectors of society (Rossato et al. 2017). Nevertheless, it has been difficult to establish one universal index to monitor drought (Heim 2002), but among the existing indices, the SPI has the advantage of requiring only rainfall data for computations and can be compared across regions with different climatic zones (WMO 2012; Zhang et al. 2017; Faiz et al. 2018; Park et al. 2018; Santos et al. 2017). The SPI has other advantages of statistical consistency and the ability to describe both short- and long-term drought impacts through the different time scales of precipitation anomalies (Cancelliere et al. 2007). The SPI is fitted to a gamma probability distribution, which is then transformed into a normal distribution so that the mean value of the index for the location and desired period is zero (Mansouri Daneshvar et al. 2013). 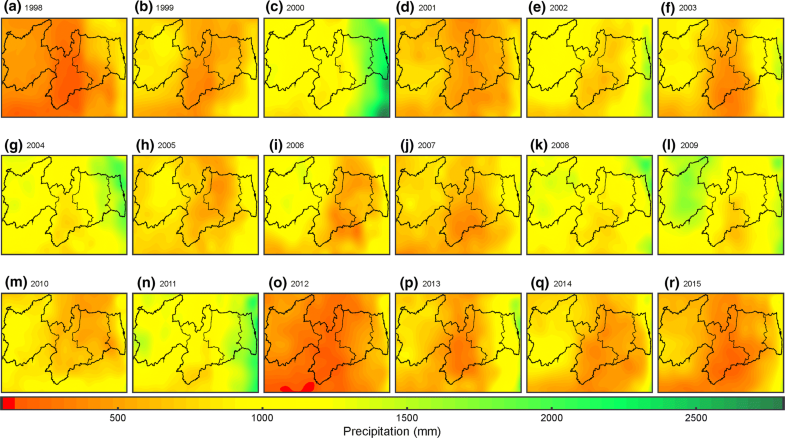 On the other hand, one of the most commonly used techniques to study the impact and spatiotemporal variations of rainfall is the analysis of trends in SPI (e.g., Wang et al. 2014; Achugbu and Anugwo 2016). Tests for the detection of significant trends in hydro-climatologic time series can be classified as parametric and non-parametric methods (e.g., Tabari et al. 2011; Silva et al. 2015; de Brito Neto et al. 2016). In many studies, the non-parametric Mann–Kendall trend test and Sen’s slope estimator method are applied to identify trends and determine their magnitudes in time series (e.g., Partal and Kahya 2006; Wang et al. 2014; Achugbu and Anugwo 2016). Previous climate research in Paraíba state, however, has seldom applied the SPI to identify drought severity (Macedo et al. 2010; Farias et al. 2014) nor identified any trends. In addition, while these previous studies in the region used a data network poorly distributed across the state, the present study uses 187 continuous daily rainfall time series over 18 years, and with these data, eight different SPIs and their respective trends are calculated through a joint application of Mann–Kendall and Sen tests. 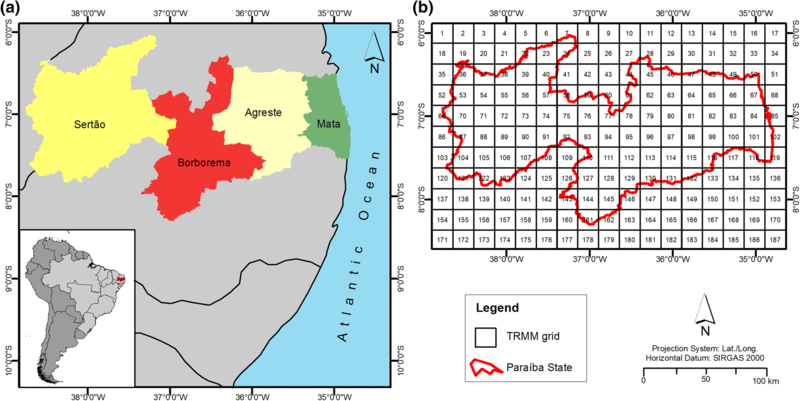 For this reason, in this study, the SPI is used to detect and characterize the temporal variability of drought in Paraíba state over the period 1998–2015 using Tropical Rainfall Measuring Mission (TRMM) data. To analyze rainfall, rain gauges are the main measuring method, but in some countries such as Brazil, the network of these gauges is not regular enough, and in some regions, the gauges are either scarce or concentrated. In this sense, radar data using space-borne sensors provide an excellent complement to monitoring continuous rainfall events at the spatial and temporal scales (Zeng et al. 2012). Thus, the TRMM (Kummerow et al. 1998; Park et al. 2018; Santos et al. 2018) has been an accurate alternative source of rainfall data, which provides the opportunity for fine spatial–temporal rainfall products. The accuracy of the TRMM data has already been tested in several studies around the world, and Pereira et al. (2013) and Soares et al. (2016) have already proven that precipitation estimates using TRMM satellites reproduce the spatial–temporal pattern of the rainfall regime both in terms of seasonality and spatial distribution in Brazil and Paraíba state, respectively. In addition, the agreement between the TRMM and the rain gauge data increases for larger time accumulation scales; thus, on a monthly scale, the correlation values found are significant. However, a small number of studies have been done using TRMM rainfall data for drought monitoring in northeastern Brazil. Nevertheless, to characterize the drought behavior, a dense and continuous data network is necessary to guarantee homogeneity and robustness of the results. Therefore, the TRMM rainfall database is suitable for the present study because it provides a continuous and well-distributed rainfall database over the region to be analyzed. The rain gauge network in the state of Paraíba, as in several other Brazilian states, presents a poor spatial distribution and has many flaws in its historical series. Paraíba has been one of the Brazilian states most affected by droughts in the last decades (Marengo et al. 2017). Drought hazards occur frequently in this region and have caused huge agricultural and socioeconomic losses. Severe water scarcity is the key problem for the development of the region, and the unevenly distributed rainfall over the year causes Paraíba to suffer from the most severe soil erosion (Xavier et al. 2016; Silva et al. 2018) and erosivity (Silva et al. 2013) in the world, beyond the picture of aggravated water scarcity in recent years. However, few studies have analyzed the severity of historical droughts in the region. Thus, the present study provides a novel geospatial drought severity classification method to simultaneously identify short-, medium- and long-term droughts and their trends over any area of interest, and the Paraíba state is used as a case study for the application of such an innovative approach. The next sections briefly describe the study area, data, methodology and obtained conclusions. The state of Paraíba has a total area of 56,469.78 km2, and it is divided into four mesoregions: Agreste, Borborema, Mata and Sertão (Fig. 1a). The relief of the state varies from lowlands at the coast to depressions in the Sertão of Paraíba state. In the coastal area (Mata mesoregion), the climate is classified as a humid tropical climate with mean temperatures of approximately 24 °C. The annual mean rainfall is 1400 mm. There are two seasons in Paraíba state, a drought season in the summer and a rainy one in the autumn and winter. The predominant climate in the state’s interior, beyond the Borborema mountain range, is semi-arid, characterized by scarce and irregular rain and low rainfall, which is sometimes less than 500 mm per year. Cabaceiras county, in the mesoregion of Borborema, holds the title of the driest municipality in Brazil, with rainfall below 300 mm per year. Along with climate, vegetation varies according to the relief. On the coastline, the vegetation cover consists of coastal plateaus with abundant bushes and grasses. In the Sertão mesoregion, especially beyond the formation of the Borborema Plateau, the most abundant vegetation is caatinga, composed of tree species such as baraúna and bushes. Thus, the study area is the rectangle that surrounds the state of Paraíba, defined by the coordinates 38.875°W to 34.625°W and 5.875°S to 8.625°S (Fig. 1b). The main purpose of this study is to spatially classify drought severity based on the rainfall data of approximately the last two decades. To use complete time series equally distributed across the entire study area, daily precipitation data of the TRMM satellite (3B42 product, version 7) are used. The TRMM is a joint NASA-JAXA satellite mission that was launched near the end of 1997 (Huffman et al., 2007; Nóbrega et al. 2008; Santos et al. 2017). The study area is divided into 187 grid cells (11 × 17), whose centroids (grid points) are equally spaced every 0.25° from 38.75°W to 34.75°W and from 6.00°S to 8.50°S, as shown in Fig. 1b. The series of the total daily rainfall for each cell (0.25° × 0.25°) was obtained for the period between January 1st, 1998, and December 31st, 2015. Figure 2 shows the interpolation of the total precipitation at each grid point by using the spline method for each year, based on the TRMM, while Fig. 3 shows the distribution of the annual mean rainfall across the study area. Figure 2 reveals that the last 4 years have witnessed the lowest rainfall levels; the year 2012, the driest year, stands out with an average value of approximately 400 mm across the study area. On the other hand, the years 2000, 2004, 2008 and 2009 were the wettest years of the study time series, with annual mean precipitation levels greater than 1100 mm. In general, the coastal region (Mata region) has the highest rainfall levels, inland Paraíba (the Sertão region) has intermediate rainfall levels, and the central region of Paraíba (Borborema region) has the lowest rainfall levels, as summarized in Fig. 3. As the rain gauge network in the state of Paraíba, and several other states, has a poor spatial distribution and many missing data in its historical series, TRMM data were used. However, to validate the TRMM data and the rain gauge network data, an analysis of the spatial distribution of the rain gauge stations and of the correlation between monthly TRMM data and rain gauges was performed, as the monthly total precipitation levels are used to calculate the SPI. Based on the geographic coordinates and on the historical series of the 267 rain gauge stations in the state of Paraíba between 1998 and 2015, the monthly precipitation values of each grid point of the TRMM were compared with the mean values of the data observed in the rain gauges located at each grid, as in Nicholson et al. (2003) for West Africa. Figure 4 shows the locations of the rain gauge stations in Paraíba, whose size/color respectively represents the percentage of missing data in the time series of that station and the correlation coefficient between the monthly TRMM precipitation data and the average of the monthly total data of the rain gauge stations located in the grid, disregarding errors, between 1998 and 2015. Based on Fig. 4, the spatial distribution of the rain gauge stations in the state of Paraíba shows that some areas have more than eight rain gauge stations per grid, while other regions have only one rain gauge station per grid. The mesoregions of Mata and Agreste are the areas with the best rain gauge station density, while the Sertão and Borborema regions have fewer rain gauge stations. In addition, although Mata has one of the highest concentrations of rain gauge stations in the state, it also shows a greater percentage of missing data per month, approximately 30%. The other mesoregions also show a significant number of errors, which demonstrates the uneven distribution of the rain gauge stations in the state of Paraíba and the presence of several series with errors during the period analyzed. Figure 4 also shows the distribution of the correlations between the monthly data of the rain gauges and the TRMM data. The analysis of Fig. 4 reveals that almost all the state of Paraíba shows significant levels of correlation and that, in the coastal area of the state, the values of the correlation coefficient are slightly lower compared with the values found inland; however, the order of magnitude of the correlation values is basically higher than 0.80 across the entire state. Thus, as a final conclusion, the TRMM data for the study period were used to spatially classify drought severity because such data provide a good representation of precipitation behavior in the state of Paraíba. The SPI is a measure of rainfall deficit that is uniquely related to probability and was introduced by McKee et al. (1993) to measure drought severity. In this study, the SPI was calculated using TRMM data for each grid (187 time series). These precipitation data were organized into a gamma distribution range and then transformed into a standard normal distribution, i.e., with a mean of 0 and a standard deviation of 1 (Fig. 5), in which negative SPI values indicate that the precipitation levels were lower than average and vice versa. Figure 5 shows the relationship between the SPI classification and the normal curve. The class near the norm would be the combination of two classes: − 1.0 ≤ SPI ≤ 0.0 (mild drought) and 0.0 < SPI ≤ 1.0 (mild wet) (Ashraf and Routray 2015). The percentages in the regions bounded by the dashed and blue lines indicate the probability for SPI values to fall within that region; global cumulative probabilities correspond to the total area under the curve between two boundaries of interest. For example, SPI values of − 1.0 or lower occur in only 15.87% (i.e., 2.28% + 4.41% + 9.18%) of the cases. The total rainfall for each grid of interest and the time scale are set into a gamma distribution. Then, the cumulative probability H(x) is transformed into the standard normal variable Z with a zero mean and a variance of one, which is the SPI value. More details may be found in Santos et al. (2017). Finally, according to the obtained Z value, these total rainfall data can be classified as drought for values less than or equal to zero and wet for positive values, and as mild (0.0 < |SPI| ≤ 1.0), moderate (1.0 < |SPI| ≤ 1.5), severe (1.5 < |SPI| ≤ 2.0) and extreme (2.0 < |SPI| ≤ 3.0). where f(t) is a continuous monotonic increasing or decreasing function of time, and the residuals εi can be assumed to be from the same distribution with zero mean; it is also assumed that the variance of the distribution is constant in time. The objective is to test the null hypothesis of no trend, H0, against the alternative hypothesis, H1, where there is an increasing or decreasing monotonic trend. In the computation of this statistical test, both the so-called S statistics given in Gilbert (1987) and the normal approximation (Z statistics) are exploited. For time series with fewer than 10 data points, the S test is used, and for time series with 10 or more data points, as in the present case, the normal approximation is used. The minimum values of n depend on the set significance level. For example, for a significance level of 0.01, the required minimum value of n is 6. The significance level 0.01 means that there is a 1% probability of making a mistake when H0 of no trend is rejected. Thus, the significance level 0.01 means that the existence of a monotonic trend is very probable. Then, such a Z value is used to evaluate whether there exists a statistically significant trend in the time series, in which a negative Z value would indicate a downward trend, whereas a positive value would indicate an upward trend. To test for either a downward or upward monotonic trend (a two-tailed test) at the α level of significance, H0 is rejected if the absolute value of Z is greater than Z1−α/2, which is obtained from the standard normal cumulative distribution tables. Figure 6 shows the mean monthly hyetograph (Fig. 6i) of the 187 series in the study area (Fig. 1b) between 1998 and 2015. It also shows the SPI-1, SPI-3, SPI-6, SPI-9, SPI-12, SPI-18, SPI-24 and SPI-48 indices calculated from the time series of the monthly mean precipitation of the study area, divided into groups that characterize the droughts as short-, medium- and long-term droughts, i.e., the SPI-1, SPI-3 and SPI-6 indices are related to short-term drought analyses (Fig. 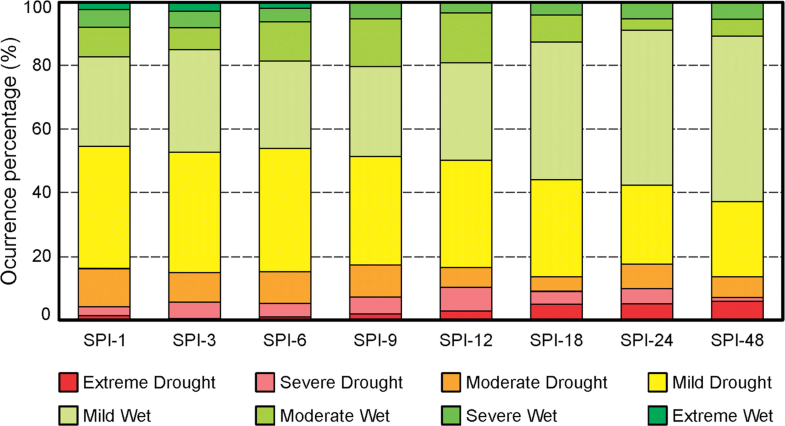 6a–c), the SPI-9 and SPI-12 indices are related to medium-term drought analyses (Fig. 6d–e), and the SPI-18, SPI-24 and SPI-48 indices are related to long-term drought analyses (Fig. 6f–h). Based on Fig. 6, the shorter the interval of the drought analysis, the greater the frequency of variation of SPI values between negative and positive values, breaking the continuity of an event with negative or positive SPI value. In addition, there is substantial similarity among the short-, medium- and long-term series: there is a slight difference in the SPI values, but the same behavior of continuity of dry and wet events is maintained throughout the series. Figure 7 shows the occurrence percentages of drought and wet events for each SPI studied, to obtain a more detailed classification of the drought conditions found for the monthly mean precipitation (Fig. 6i) in the study region. This figure is important because it provides a means to evaluate in an integrated way the frequency of each type of drought or wet event for each SPI in the region as a whole throughout the time series, disregarding local peculiarities. Thus, when evaluating different SPIs, it can be seen from Fig. 7 that for SPI-6, which is commonly associated with agricultural droughts, the sum of the percentages of the occurrence of mild (38.9%), moderate (10%), severe (4.3%) and extreme (0.9%) drought events resulted in more than 50% of all possible events, indicating a predominance of drought events based on the monthly average rainfall series over the study area (Fig. 6). On the other hand, when evaluating the behavior of the different types of events and their frequencies, it can be seen from Fig. 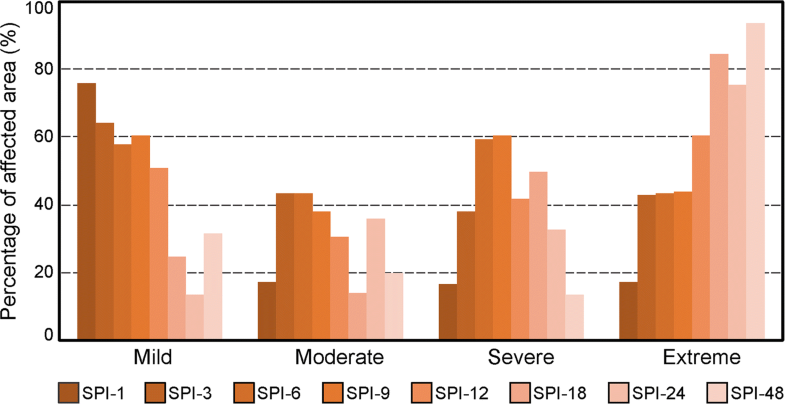 7, for example, that the mild drought event (yellow bar) represents approximately 40% of the possible events when SPI-1 is analyzed, but when SPI-48 is analyzed, such a percentage decreases to approximately 20%. This joint analysis of event frequency for each evaluated SPI is important to obtain a more refined characterization of the behavior of the region regarding different types of droughts, whether short-, medium- or long-term. The short-term analysis shows that there was a greater occurrence of drought events than wet events, surpassing 55% of the total possible value. The medium-term analysis reveals that there was a greater balance between the number of drought and wet events, while there was a lower occurrence of drought events than wet events within all the intervals analyzed for the long-term analysis. An increase in the interval of the drought analysis is related to a reduction in the percentage of drought events, reaching approximately 35% of the total possible value for SPI-48, for example. However, as the analysis interval increases (from short- to long-term), the percentage of severe and extreme drought events increases. The occurrence of extreme drought events, for example, changes from a basically null percentage in a short-term analysis to values that reach almost 6% of the total possible value in long-term analyses. This result means that, in the analysis of SPI-48, with 169 events calculated for the time series (216 – 47), almost 10 events were characterized as extreme drought events. The number of drought events decreased, but they became more severe as the analysis interval increased. Extreme and severe wet events basically remained constant for all SPIs analyzed, but the analysis of the moderate wet events, for example, showed a considerable increase of occurrence percentage of this type of event in the medium-term analyses, SPI-9 and SPI-12, whereas the mild wet events increased considerably as the drought analysis interval increased. 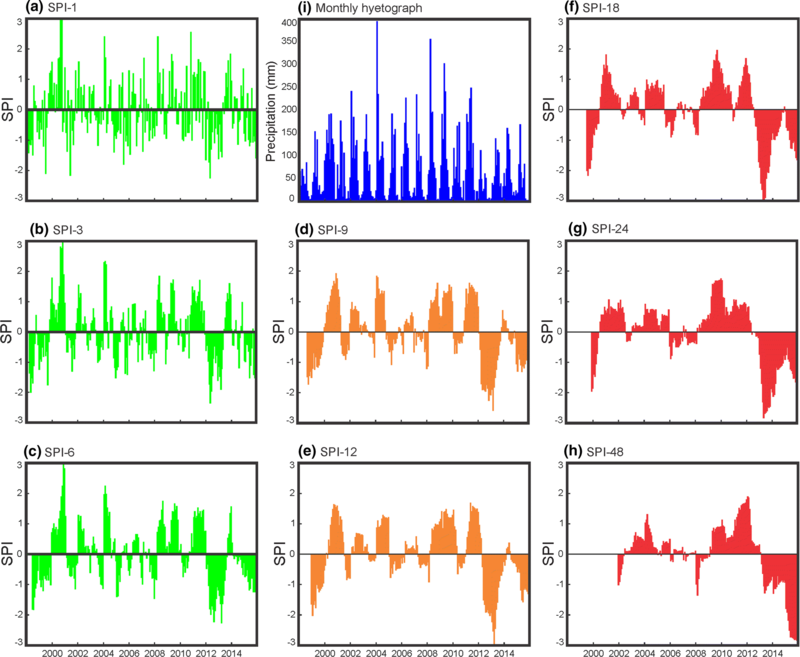 Figures 6 and 7 were designed based on a mean time series in the study area; however, Fig. 8 shows a spatial analysis, for which each time series of each SPI (SPI-1, SPI-3, SPI-6, SPI-9, SPI-12, SPI-18, SPI-24 and SPI-48) of each one of the 187 grids was calculated. Then, the respective occurrence percentages of each drought event (mild, moderate, severe and extreme) were characterized. Figure 8 is of great value because while Fig. 7 shows, for example, that the percentage of extreme drought event was approximately 6%, when SPI-48 is analyzed, Fig. 8 shows where such events occur. More specifically, Fig. 8 is of utmost importance for this type of analysis not only because it couples the information of 187 figures analogous to Fig. 7, as there are 187 grid points and precipitation time series (Fig. 1), but also because it spatializes the obtained results. Although Fig. 7 provides important information and characteristics of the region as a whole, from Fig. 8, it is possible to further detail the behavior of each region of the study area regarding the frequency and type of the drought events, which are valuable information for regions with diverse rainfall regimes. In this case, it is important to highlight that as the focus of this study is to evaluate drought conditions, only the drought events are shown in Fig. 8, and for this reason, 32 maps are presented, referring to the eight analyzed SPI and the four types of drought events, i.e., extreme, severe, moderate and mild. According to the occurrence percentages of each type of drought event for each SPI index analyzed throughout the entire time series shown in Fig. 8, for SPI-1, for example, in the majority of the state of Paraíba, approximately 30% of the events that occurred between 1998 and 2015 were mild drought events. This result means that within 216 months (1998–2015), approximately 60 months showed SPI values higher than or equal to –1.0 and lower than or equal to 0.0, i.e., a value of 30%. The analysis is analogous for the other classifications and SPI indices. For SPI-48, especially in the region of Borborema, there were high percentages of extreme drought events, totaling values close to 8%. For this SPI, of the 169 months (216 – 47), more than 10 events showed SPI values lower than –2.0. For a complete characterization of the drought events that have affected the region of the state of Paraíba, the type of drought was characterized according to the classification proposed by Santos et al. (2017), i.e., short-, medium- and long-term drought, depending on the type of drought event (extreme, severe, moderate and mild) analyzed. Using the global cumulative probability shown in the normal distribution curve of SPI (Fig. 5) as a boundary percentage to determine which region had been affected by drought, the drought affecting a given region was characterized according to the analysis interval. For extreme drought events, for example, any grid that reached the occurrence percentage of this type of event of more than 2% throughout the time series would reveal that the occurrence percentage would be higher than what was expected according to the normal distribution of the SPI curve. 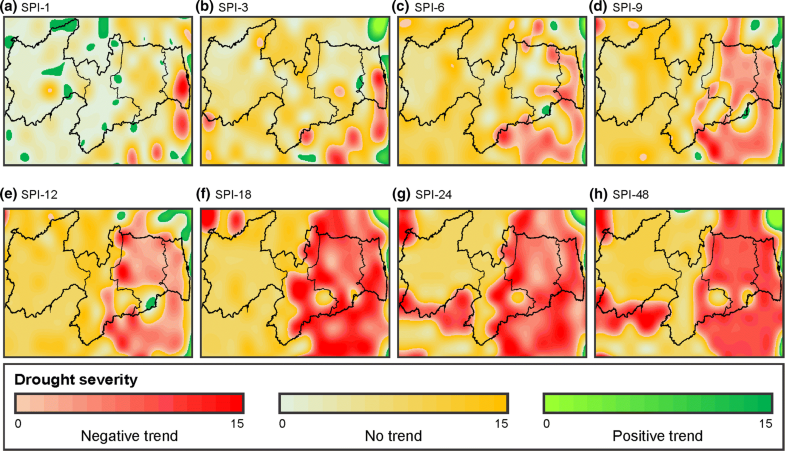 Therefore, an analogous idea was followed for all types of drought events and for each SPI analyzed, resulting in the spatial distributions shown in Fig. 9. To characterize the drought events, an alternative classification was performed, in which the drought type (short-, medium-, and long-term) was categorized according to the analyzed drought event type (extreme, severe, moderate, and mild). The global cumulative probability presented in Fig. 5 was used as the limit percentage to determine whether a location was affected by some type of drought. For example, for mild drought events in an SPI-1, SPI-3, or SPI-6 analysis, any region with an occurrence percentage over 34% would be affected by short-term droughts, whereas in an either SPI-9 or SPI-12 analysis, the region would be affected by a medium-term drought. Figure 9 simultaneously reveals two pieces of information, as it shows the spatial distribution of the areas affected by short-, medium- and long-term droughts for all types of drought events (mild, moderate, severe and extreme). Mild drought events tend to affect most areas of Paraíba when short-term droughts are analyzed, while the coastal region and the Sertão are affected when medium-term droughts are analyzed, and basically, the coastline is affected by such events when long-term droughts are analyzed. In moderate drought events, the coastal region is the most affected area for short-, medium- and long-term droughts, and for this type of drought event, the smallest percentages of the areas affected by droughts are found compared with other types of drought events, i.e., mild, severe and extreme droughts. For the severe drought events, the SPI-6, SPI-9 and SPI-18 indices are those that most affected the state of Paraíba, and the regions of Borborema and Agreste are the most affected. Finally, regarding extreme drought events, Paraíba is considerably affected when the long-term droughts are analyzed. For SPI-48, for example, the entire state is affected by extreme drought events in such a time scale of 48 months, except for a small southern region in the coastal area. Figure 10 shows the percentage of the area affected by each SPI regarding a given type of drought event. These results show that the long-term droughts (SPI-18, SPI-24 and SPI-48) affect Paraíba more significantly, as more than 75% of the region is affected in extreme drought events. The medium-term droughts (SPI-9 and SPI-12) basically show the same behavior and affect 40–60% of the study region for all types of drought events, except for the moderate drought events. On the other hand, the short-term droughts affect the state of Paraíba more significantly when the mild drought events are analyzed. Once more, we can see that as the drought analysis interval increases, i.e., from short- to long-term drought, the more severe are the drought events affecting the region. Following a methodology analogous to that used by Santos et al. (2017), a new classification of drought severity is proposed. With global cumulative probabilities shown in the SPI distribution curve (Fig. 5), the severity of the drought affecting a given region for each one of the SPIs analyzed is characterized. For example, the probability of an extreme drought event occurring is approximately 2%, while the probability of a mild drought event occurring is somewhat greater than 34%. Taking this into account, the weight attributed to the occurrence of an extreme drought event is much higher than the weight of a mild drought event. Based on these probabilities, a new drought classification can be developed. For example, the drought severity (DS) index for each region where the four types of drought events occurred (extreme, severe, moderate and mild drought) is equal to 0.805, as the result of the sum of 1/2.28 + 1/4.41 + 1/9.18 + 1/34.13, while DS would be equal to 0.109 for a region where there was only a moderate drought event during the period analyzed (1/9.18). Table 1 shows the complete classification for all types of combinations of drought occurrences, which receive classifications from 0 to 15. Table 1 shows that the classification 0 represents a region that is not affected by any type of drought event, while the classification 15 represents a region that is affected by all types of drought events. When there is low global cumulative probability of extreme drought events, the weight attributed to this type of event is higher. Therefore, the regions that are affected only by extreme drought events, regardless of the drought analysis interval, are classified as high-severity drought areas. Figure 11 shows the spatial distribution of the drought severity classification of the state of Paraíba for each SPI calculated based on the TRMM between 1998 and 2015. In summary, Fig. 11 represents the set of information provided by Fig. 9, in which, for a given SPI, a classification value (from 0 to 15) of drought severity is attributed based on the types of drought events that affected a given region. For example, Fig. 11a represents the set of information provided in the first line of Fig. 9 (i.e., Figures 9a–d) combined with the classification shown in Table 1. For short-term droughts, i.e., SPI-1, SPI-3 and SPI-6 (Fig. 11a–c), there are many regions that show low classification values of drought severity. The comparison of this piece of information with that illustrated in Fig. 9 shows that, although the majority of the state of Paraíba was affected by mild drought events, the state was not affected by other types of more severe drought events. Therefore, the severity classification was lower (Table 1). For medium-term droughts (Fig. 11d–e), there is a considerable increase in the severity classification of droughts that affected the region, especially due to extreme and severe drought events, which affected primarily the regions of Sertão and Borborema. For long-term droughts (Fig. 11f–h), the greatest drought severities are found, and they occurred especially due to extreme drought events that affected the region. In the classification of drought severity, if the drought analysis interval is increased (from short- to long-term drought), the level of severity (DS) in the entire state increases. Special attention may be drawn to the coastal region, as the classification values of DS for SPI-1 to SPI-12 were frequently lower than 5, whereas there were high values of DS classification for SPI-18 to SPI-48 (long-term droughts) in several regions. The Mann–Kendall and Sen’s tests were applied to each one of the 187 time series of SPI-1, SPI-3, SPI-6, SPI-9, SPI-12, SPI-18, SPI-24 and SPI-48 to analyze the trends of the SPI indices, using a Matlab script developed by Burkey (2006). In this study, as noted previously, a significance level of 0.01 was used to obtain 99% confidence in the trend results of each short-, medium- and long-term time series in the study area. Figure 12 shows the spatial distributions of the SPI series that did or did not show a trend at the significance level of 0.01, while Fig. 13 shows a spatial distribution of the real slope of these series (Sen’s slope). In all the drought analysis intervals, most parts of the Agreste and Mata mesoregions show a trend at the significance level of 0.01. As the drought interval increases, that is, as the analysis interval changes from short- to long-term drought, the majority of the state of Paraíba shows this trend. For instance, the analysis of the long-term droughts (SPI-18, SPI-24 and SPI-48) reveals that the entire state shows a trend, except for the region of Sertão. The joint analysis of the results and the observation of the points and regions that showed a trend in the Mann–Kendall test reveal that the majority of the state of Paraíba shows a negative trend. This result indicates that the SPI values, to which Sen’s test was applied, tend to be lower; thus, the intensity and severity of drought events tend to be higher. 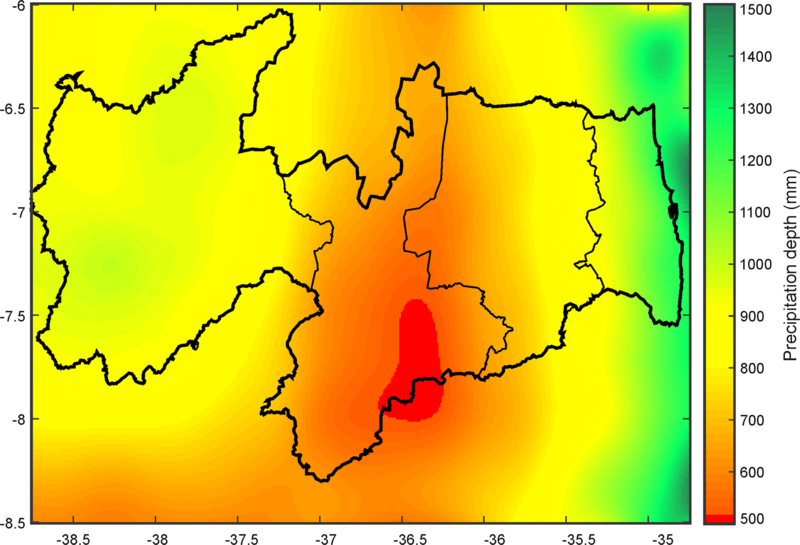 Sen’s test also shows that the negative slopes of trend of each of the 187 series of the TRMM grid tend to be pronounced in the coastal region and less pronounced in the Sertão mesoregion. Borborema and Agreste are the mesoregions that show mean negative slope compared with the extremes of the state (coastline and Sertão). 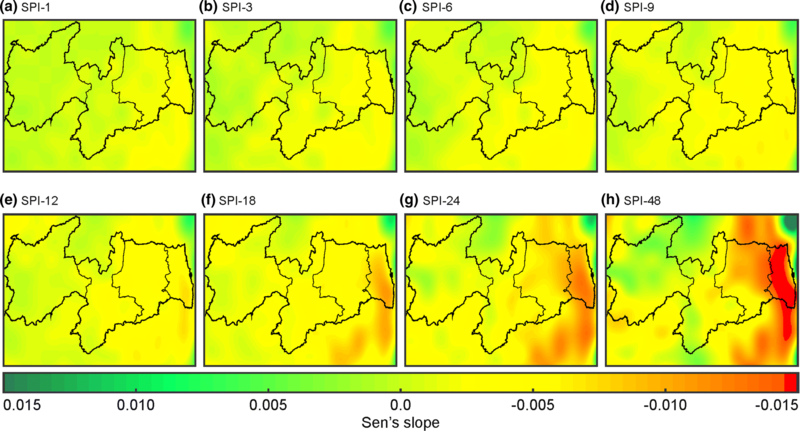 The application of Sen’s test shows that, as the drought analysis interval changes from short- to long-term drought, the slope values tend to be more pronounced in any region of the state of Paraíba, and, therefore, the trend is that SPI values are increasingly smaller. To summarize all drought information in one risk analysis classification, the information of each one of the SPI indices and of the Mann–Kendall and Sen’s tests are gathered. Based on the drought severity classification, on the information about which series show a trend or not and on the slope of the trend line of each one of the series, a classification is proposed to analyze the current situation of a given region regarding drought, as well as its trend at the significance level of 0.01, for any SPI. In this case, there are three possible trends: positive, negative and no trend, which are represented by the colors green, red and orange, respectively. In addition, the classification from 0 to 15 (Table 1) provides the information on drought severity. For example, 0 shows that the region was not affected by any type of drought event, while 15 indicates that the region was affected by all four types of drought events. Therefore, the classification 15 red indicates that a given region was affected by all types of drought events and that the SPI series shows a negative trend, which means that the SPI values are increasingly lower, intensifying the number of drought events. On the other hand, the classification 15 orange shows that, although the region was affected by all types of drought events, there was no trend at the significance level of 0.01. The classification 8 green means that the region was affected only by the extreme drought events, but its SPI series showed a positive trend. With this classification, it is possible to know exactly which types of drought events did or did not affect the region and what are the trends of the SPI series analyzed and, therefore, the situation of drought risk analysis. Figure 14 shows the spatial distribution of such drought risk analysis for each SPI over the state of Paraíba for the period analyzed, using the spline spatial interpolation method; other interpolation techniques could also be used (e.g., indicator kriging and disjunctive kriging), as used by de Brito Neto et al. (2016), but for the interpolation of the present data, the spline method showed to be adequate, as suggested by Huang et al. (2014). The analysis of Fig. 14a–c shows that, for short-term droughts (SPI-1, SPI-3 and SPI-6), the coastal area was the region most significantly affected by this type of drought, showing a negative trend of the SPI values. On the other hand, the Agreste, Borborema and Sertão regions of Paraíba basically did not show trends in the SPI values, and the low values in the classification indicate that these regions were not severely and simultaneously affected by extreme, severe, moderate and mild drought events. 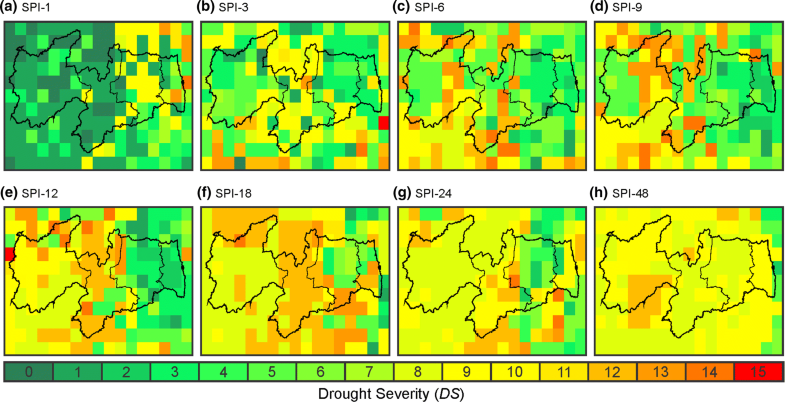 The analysis of the behavior of medium-term droughts (SPI-9 and SPI-12), based on Fig. 14d, e, shows that most of the coastal area and the Agreste of Paraíba were affected by these drought events, which were predominantly moderate and mild. Furthermore, according to the series trend analysis, the SPI values tend to be increasingly lower, which worsens the situation in these regions. The Sertão and Borborema mesoregions were also affected by medium-term droughts; however, the majority of these regions did not show a trend at the significance level of 0.01, which indicates that the SPI-9 and SPI-12 values tend to stay constant in these regions. Based on Fig. 14f, g, h, the analysis of the long-term droughts (SPI-18, SPI-24 and SPI-48) shows that for such droughts, the majority of the coastal region and the Agreste was affected by these droughts, and according to the trend analysis, the SPI values tend to fall more and more. Unlike what occurred in the medium-term drought analysis, some regions of Sertão and Borborema were not only significantly affected by these types of droughts but also showed a negative trend in their time series. However, it is worth noting that most of these regions located in inland Paraíba showed the same behavior as the analysis of the medium-term droughts, accepting the null hypothesis of the Mann–Kendall test and admitting that the series did not show downward or upward monotonic trends. This paper dealt with the analysis of drought trends in Paraíba state using TRMM data and the application of the Mann–Kendall and Sen tests based on the SPI indices. The main purposes were to analyze the severity of droughts that affected Paraíba state and to statistically evaluate whether there were monotonic upward or downward trends of SPI at different time scales during the last years. Thus, the study was focused on the analysis of the changes that have occurred since 1998; therefore, there was no need to divide the time series to guarantee the monotonic trend and, thus, the Mann–Kendall test, the Sen test and the TRMM data were suitable for such a purpose. In addition, several indices could be used for drought analysis, but the World Meteorological Organization recommends the SPI for monitoring of dry spells because it requires only monthly precipitation data, can be compared across regions with markedly different climates and can determine the rarity of an ongoing drought. 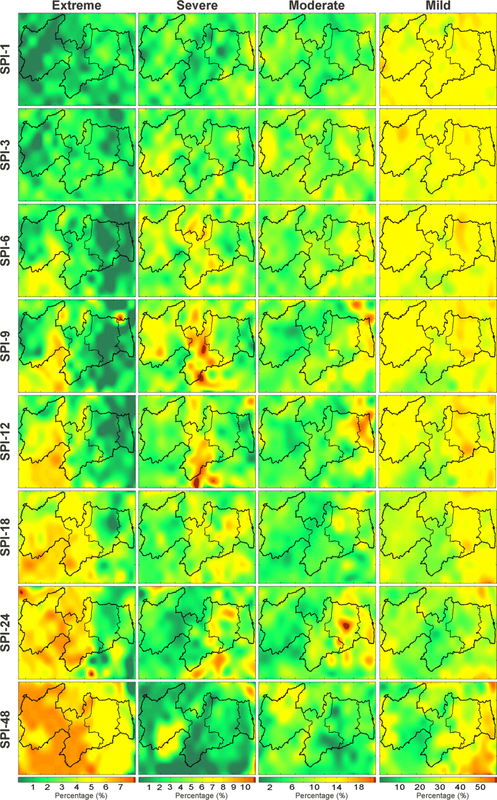 Thus, a high-density network of daily precipitation series (187 time series) from the TRMM mission across Paraíba state was used for a period of 18 years (1998–2015), corresponding from the same product, 3B42 (V7), which also ensured the homogeneity of the data used. For the SPI analysis, a drought severity analysis classification (DS) based on the global cumulative probabilities of the SPI curve was proposed. According to this classification, for short-term droughts, it was noted that many regions present low values of drought severity classification, among which the Borborema region presented the highest drought severity classifications among the studied mesoregions. For medium-term droughts, there was a considerable increase in the severity classification of the droughts that affected Paraíba state, mainly in the Sertão and Borborema regions. For long-term droughts, the highest drought severity that was found affected the coastal area considerably. From the classification of drought severity, it is noted that by increasing the drought analysis interval (from short- to long-term), the degree of severity (DS) over the entire state increases. In addition, special attention can be given to the coastal area when analyzing long-term droughts and to the Borborema region when analyzing short- and medium-term droughts. Analyzing the results of the Mann–Kendall test, it was noted that in all the different intervals of drought analysis, most of the Agreste and Mata mesoregions of Paraíba presented trends at a significance level of 0.01. According to the Sen test, a great part of Paraíba state has negative trends, which tend to be more accentuated in the coastal area and less pronounced in the Sertão region. In addition, it was observed that as the analysis interval of the drought changes from short- to long-term, not only does most of Paraíba state begin to show a trend but also the trend line slope values tend to be more negatively accentuated in any region of Paraíba state. Finally, an innovative approach for geospatial classification of drought risk analysis was proposed, based on the drought severity classification, on the trend line slopes for each time series, and on whether the time series presented a trend or not at a significance level of 0.01, as for (a) risk of short-term droughts: the coastal area was the region most significantly affected, and the SPI values showed a negative trend, but the Agreste, Borborema and Sertão regions of the state of Paraíba basically did not show trends, and the low classification values indicated that these regions were not severely and simultaneously affected by extreme, severe, moderate and mild drought events; (b) risk of medium-term droughts: the majority of the coastal area and the Agreste region of the state of Paraíba was affected by predominantly moderate and mild drought events, and the SPI values tend to decrease, which worsens the situation for these regions. Although the Sertão and Borborema regions are affected by medium-term droughts, they basically did not show a trend; and (c) risk of long-term droughts: the majority of the coastal area and Agreste was also severely affected by long-term droughts, and the SPI values tend to decrease more and more. In addition, some regions in the Sertão and Borborema were not only severely affected but also showed a negative trend. On the other hand, most regions located within the limits of the state of Paraíba did not show downward or upward monotonic trends. In this way, the proposed classification is shown to be useful because it allows identifying which types of drought events affected a region and whether a trend exists and provides the index variation rate for each drought duration analysis (short-, medium- and long-term). The financial support provided by the National Council for Scientific and Technological Development, Brazil – CNPq (Grant No. 304213/2017-9, 304540/2017-0 and 408631/2016-3) and the data from the Tropical Rainfall Measuring Mission (TRMM) are gratefully acknowledged. This study was also financed in part by the Brazilian Agency for the Improvement of Higher Education (Coordenação de Aperfeiçoamento de Pessoal de Nível Superior - CAPES) – Fund Code 001, and Universidade Federal da Paraíba.